To ensure the best trail conditions, the Twin Pine Snowmobile Club has a fleet of 250 horsepower BR 400 Bombardier diesel groomers . Do you dream about waking up to freshly groomed snowmobile trails? We do too. We believe the best snowmobile trail conditions in Maine are right here in the Katahdin region. To enjoy a fun snowmobiling experience with safety in mind, we offer easy access to many of Maine’s well-maintained and clearly marked trails. Many snowmobile enthusiasts travel thousands of miles to ride our trails. Watch this video to see why Maine is a great snowmobile destination! This video was prepared by the Maine Office of Tourism and was shot in the Katahdin region at NEOC. To ensure the best trail conditions, the Twin Pine Snowmobile Club has a fleet of 250 horsepower BR 400 Bombardier diesel groomers (used by major ski resorts) and a dedicated staff of snowmobile trail groomers. 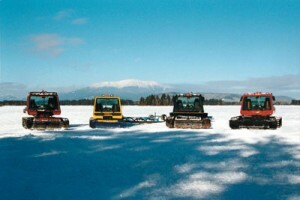 The Club covers 130 miles of Maine snowmobile trails in the Katahdin region of Northern Maine and trails are groomed as often as weather and conditions allow. The ITS Trail System connects throughout Maine and to the other states depending on snow and weather conditions. We’re proud to help manage and support the Twin Pines’ Snowmobile Club. Are you passionate about snowmobiling in Maine? Join the Twin Pine Snowmobile Club today for $35 and help maintain the Katahdin Region’s spectacular trail system. This membership entitles you to a year membership to both the Maine Snowmobile Association (MSA) and Twin Pine Snowmobile Club. You will receive all MSA monthly mailings, $3,500 accident insurance through the MSA, membership card and sticker.